Tommy Seebach Mortensen (September 14 1949 - Maart 31 2003)was a popular Danish singer, composer, organist, pianist and producer. Tommy began his musical career as an organist in his own group The Colours at age 14. In the following years he played in many pop and beat groups. He played the piano with various orchestras and groups, sometimes going under the name of Boogie-Woogie-Tommy. He gained mainstream popularity in Denmark in 1965, when he became a member of the band Sir Henry And His Butlers, writing many of their most popular hits. He also worked as a recording engineer at the Rosenberg Studio in Copenhagen. In 1976 he emerged as a successful solo artist. His hit album Tommygun was released in 1977. At the same time he was in high demand as a producer at his record company EMI, where he was involved in projects for artists such as Lecia & Lucienne. 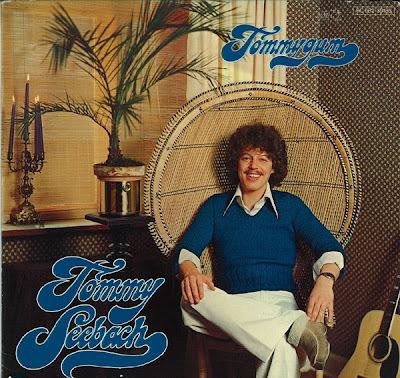 Tommy Seebach competed seven times in the Danish Melodi Grandprix, the pre-selection for the Eurovision Song Contest. In 1978 his song Gi' Mig Et Signal was not chosen to participate at the Danish national final. 1979: his song Disco Tango, won the Danish pre-selection and came 6th at the ESC in Jerusalem. Disco Tango became a major hit both in Denmark and other European countries. 1980: Bye-Bye, performed by Lecia & Lucienne, 7th. 1981: Tommy Seebach won the competition once again, in a duet with Debbie Cameron. The song Krøller Eller Ej came 11th at ESC in 1981. Cameron has later alleged that Denmark and Israel had been among countries whose sound checks had been sabotaged in order to bring England's Buck Fizz to the victory. 1984: Pyjamas For To, 4th. 1985: Det’ Det Jeg Altid Har Sagt, 2nd. 1993: Tommy won the competition again, performing the song Under Stjernerne På Himlen. He had submitted the song several times before, but had been turned down. At the time, the public interest in the Song Contest, deemed cheesy by the cultural élite, was fading, and as an icon of the contest, Seebach's popularity had been on the wane for some time. It has been alleged that Danmarks Radio had originally turned the song down out of fear that Seebach, who had developed a severe addiction to alcohol, would cause a scandal at the performance. When the song came in as a no. 1, his popularity soared for a while, but only to drop dramatically, when the song finished 22nd out of 25 songs at Eurovision Song Contest 1993, receiving only 9 points. The poor result meant that Denmark did not qualify for the ESC 1994, and Tommy Seebach was widely criticized, after experiencing a brief rise in popularity, and never competed again. The 1990s were lean years for Tommy as a performer and recording artist. He had a comeback with the release of a disco-version of Krøller Eller Ej released in 1999, as well as the release of a compilation album. He toured the country's discothèques at that time and found cult interest in his old hits among a new, younger audience. Seebach was married for many years to Karen Seebach and they had three children. The marriage broke down when Tommy developed a serious addiction to alcohol. One of the couple's sons, Rasmus Seebach, who also became a pop singer, wrote a song about him called Den Jeg Er, stating what a major influence his father had in his life. He died at the age of 53 at the amusement park Bakken, where he had been head of musical entertainment for several years. Although he had managed to overcome his alcoholism at the time, the cause of his death, at heart attack, was ascribed to his previous addiction.